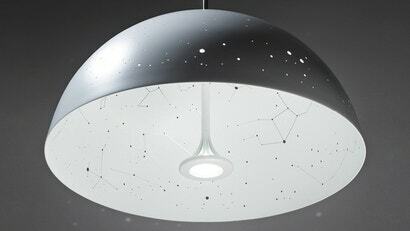 Just over a year ago, we brought you Anna Farkis's 2500W astronomical lampshade, which projects constellations on the ceiling whenever the light is turned on. At the time, it was just a one-off concept — but, as we had hoped, the stars have aligned: today, the lamps are finally available for sale under the new name Starry Lights. The lamps are available in four colours with your choice of four different constellation layouts, plus the option to design your own. Unfortunately, they come with an equally out-of-this-world $1000 price tag. For that much money, you can buy yourself a nice telescope and just drill holes in the lamps shades you already own — but damned if they're not tempting anyways.